Faced a number of these at the Arena, and its abilities does sound intimidating, if not annoying. This unit has all the special defenses (Guard, Bunshin, Barrier) equipped, a further reduction to damage, high healing and removal of Status Ailments, and a high AGS and high Evasion if it's HP goes low. Turns out I overestimated this unit and had no issues taking Asahi down. Blaster Nu can ignore all of Asahi's special defenses by attacking normally or use the All Range Attack Hissatsu. And since the Van Reis doesn't get its 200% Evasion bonus until its HP goes down in half, it means it only has a standard Evasion rating, so by the time Amuro's final ability kicks in, the rest of my team will make mincemeat out of the Van Reis. Throw in Char's Funnels that reduces Action Gauges, the Van Reis is incapable of striking back. Blaster Nu isn't the only one that can ignore special defenses. The Neo Granzon and the Blaster Dix-Neuf are just among the list of units that are capable of doing this as well. Doesn't mean the Van Reis is a weak unit. You just need to know when to put its special defenses to good use in each Arena battle. Faced with the Taiki Tauburn Compartment? Van Reis's Bunshin will help dodge Takuto's first attack. Dealing with the Destroy Gundam? Van Reis's Barrier will ensure it takes no damage, and any Status Ailments are removed by the next turn (if you get the Van Reis to perform its Omega Hissatsu first, then it's a full status resistance). Units that are Anti-Bunshin and Anti-Barrier? You've got Guard with an extra damage reduction bonus. True, the Van Reis lacks enough of an accuracy boost to deal with Dodgers. 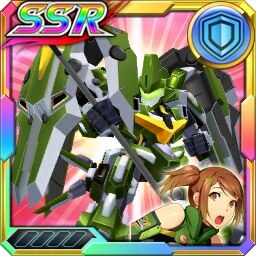 But if you have the Asahi/Shatte/Honoka Pilot Part, it has the Miracle Seishin that can potentally give the Van Reis a maximuim accuracy of 200% (an extra 50% if you use the RevolGriff Omega Hissatsu). Units like the Fighter Dragonar can help increase the Van Reis's accuracy even further to help deal with the top Dodgers. Tankers are the only units the Van Reis won't be able to break through due to the its lack of nullifying DEF percentage boosts. You would want to use the Van Reis in Conquest Mode thanks to its abilities. Stick to the Aus Frigge than the RevolGriff to help bring down multiple enemies easier. First thing you'll notice when comparing this to the Attacker Taiki version is that the Fighter Omega version has much higher stats, especially with AGI being at 9840 vs the Attacker's 5320, which is a huge difference as far AGS is concerned in the Arena. The Attacker's Accuracy boosts were 90%*, whereas the Fighter Omega's is 150%*. May not be much when fighting Dodgers, but if you combine the Intuition Seishin and use the ranged Sun Attack, the Fighter Omega version would have a total accuracy boost of 350%, and quite a damage to boot. If the enemy happens to have Toughness, you can negate it by switching to the close ranged Sun Attack as it deals combo damage. Its Anti-Barrier properties assures you can take on the Neo Granzon, Taiki Tauburn Compartment, and the Omega Van Reis. Switching to the Daitarn Hammer will help take on Tankers like the MazinKaiser. If you maximize the level of Banjo's Seishins, the Cooldown is reduced by 1 turn. With his final ability, it's reduced by another 3 turns. In this case, Intuition would have a 1 Turn Cooldown, Iron Wall can be used every turn, and Soul's Cooldown is 3 turns. This is quite a big deal and puts Banjo in a unique advantage against others. The wording on Banjo's abilities in Normal mode is a little weird, as if implying the damage he receives must be a minor one for the abilities to take effect as opposed to taking a huge hit. Would be easier to just say the abilities kick in if his HP is less than full. I am not sure if you can fuse this with the other classes of the Daitarn 3. But in any case, this version is a keeper if you get it. - (Arena/VS/Battle Mode) Cost 5 Cores; Targets All Enemies; Boost Accuracy by 50%; Deal 200% Damage; Ignore Guard, Barrier, and 100% of DEF; Reduce Action Gauge to 0. This unit is an Anti-Tank unit thanks to its ability to ignore DEF, Guard, and Barrier. Its ability to attack twice gives you more potshots, and the Action Gauge reduction assures your target cannot fight back unless he/she is immune to it. Avoid fighting units with an Evasion boost of more than 150% or Bunshin. You will have to choose your Seishin carefully as the Dancouga Nova has a slightly low AGI , no DEF boost, and lacks a healing ability unless your allies can make up those weaknesses for you. 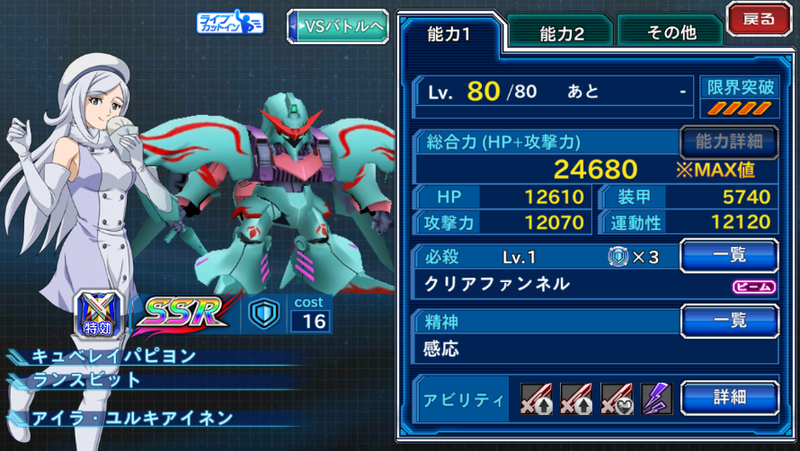 Worth noting that including the Dancouga Nova, there are only 8 Blaster Units that are Taiki (no Omega unit as of yet). The others are the Gundam Zabanya, Rafael Gundam, Nu, Tallgeese 3, Raiden, Hanabi's Kobun F2, and the Dix-Neuf. So having any of them in your team will surely benefit from Aoi's final ability. Speaking of Aoi's final ability, in Normal mode it allows her Hissatsu to become stronger the longer you don't use it (the effect obviously resets when you do). Makes it sound like this Dancouga Nova is also designed for Conquest Mode, specifically Stage 20-C where you have to deal those annoying horde of Overman units. "WHO DO YOU THINK WE ARE?!" The 2nd unit in this game to have a full slot of EX abilities. Kind of disappointed that the base damage of the Omega Giga Drill Break is still lower than the Gundam X's Satellite Cannon. It does however, make up for it by its abilities to assure it has an extra 60% damage. Whereas Neo Granzon is specialized in defense, TTGL specializes in offense. Its boosts to ATK and Accuracy assures you have no chance dodging its attack unless you have the Flicker seishin. It also ignores Guard, Barrier, Bunshin and 100% of DEF. The longer TTGL stays in the field, the stronger and more devastating it becomes, and there is no limit to the stacks. You would do well to keep TTGL protected by giving it DEF boosts from Getter Go and Santa Oldrin, for example and play the long game to ensure victory. Because TTGL is mainly an offensive unit, it lacks any Evasion boosts, so it can't dodge anything you throw at it. Do it early, and you can land plenty of damage before it even heals. Unlike Neo Granzon, TTGL cannot counterattack. It's also not immune to nerfs, so attacking with the Taiki Sazabi's Combo Hissatsu, for example will lock out TTGL's use of Seishin and the Giga Drill. You can also land attacks that reduces its HP and DEF to slightly counter the affects of its 1st ability. And like the Neo Granzon, taking the TTGL out means their entire team gets badly nerfed for an easier clean out. Since taking out the TTGL ASAP is the key to success, suggested units would be Specineff, Taiki Tauburn Compartment, Taiki Chirico, Durandal, and the Destroy Gundam. If TTGL's formation puts it wide open, you may opt to use Blaster Nu or the Devilfish for extra potshots and a Hissatsu spam. The only thing I find TTGL useful in Conquest Mode is in stages where you fight units with barriers. You do NOT want Simon and Viral to take on Team Haman, lest you face the frustration of the one of the largest and strongest units in SRW getting wrecked by a team of MS units with Funnels. TTGL is very strong, justice was done i'm still against the thing of with the reduced rate to get it, however it seems like it will be a thing with all the units with 4 EX and overpowered status from now on. on Arena is devastating but not frustrating to fight against, it also can clear the new Conquest mode 30 map, since its immune to status effects and its Hisatsu reach all area. Reviews incoming is Russia world cup so we get a Russian girl cause why not? Aila's Quebeley has normal status for a Taiki with a huge mobility that is expected from a real, her DPs however its not very good, like all the units with big weapons she also suffers from having to move the lance toward all the animation and that results on her having low DPS, what its not really a big problem since she is a defender right? well.. Aila kit its rather weird for a defender unit so it can be a problem, lets go towards it. Using 3 cores The papilon shoots his funnels on a area of 3x3 just like Haman's ones, it also has the same modifier 600% with the advantage of...this unit funnels penetrate barriers and does increased dmg on enemies that has barriers, this unit loses the normal blind effect that the quebeley's funnels had and trade it for damage and it adds 1 core on the back of it all. as you can see its very strong on the Arena and you should't let she fires it the first one, if she does you will begin to have a slowed,blinded, and a team being hited by the quebeley papilon every turn with this since its a very easily spamable hisatsu, downside its that the modifier its only of 100% so it won't really kill the strongest units just annoy. Inspire: Increase hit rate and evade of units around Aila for a certain time. Confidence: increase in attack power + increase on critical hit rate. Perception of Plavsky Particles - > Increase attack power, dodge and critical rate (5%) its basically Newtype with another name. Invisible Attack - >When on enemy area, increase accuracy, attack power and dodge. the modifier on this is probably 20% i'm not sure, however it does gives Aila a sensible buff when she is on the enemy area sorta off like the old Santa Mari had, this is not a problem Aila is made to be on the frontlines. Aila Exclusive Gunpla -> When Papilon's Hp is more than 50% she receives a big buff on attack,evasion and hit rate. this is a very great ability and the one makes the unit shines i has a big modifier and you don't need to stack to make it work, however it has a trade off, you have to maintainher hp above 50% , and Aila has no meeins to heal herself, that means that you or bring a support unit for her, or if you're skilled with your fingers manual dodge a LOT, since her mobility its pretty top tier, however having low armor, and being a frontliner this unit can suffer on squads that relay more on her than they should. its sorta off like Destiny Gundam buff, however Destiny is a shooter, i'm not a fan of HP/huge bonus trade offs, since most of the time when we really need taiki units that does devastating area dmg like this one, we face enemies that also destroy said units fast enough. Embodied System - > When Aila dodge's a attack the opponent get burned/stunned, this is a locked skill and she must be lvl 65 to learn it, however she is a Taiki so you will level break her anyway. reduce gauges by 30% on normal attacks, ignore barriers, and block, can seal hisatsu and HP regen, and speed up her defender teammates, she also has a sensible buff on her to evade making her being on any of the super commander teams. An improvement of the Attacker Taiki version, the Omega version has a higher HP and AGI, you get double its ATK percentage, and a nice boost in Accuracy, Evasion, and AGS. Being immune to Status Ailments and self heal with extra cores, and the addition of counter-attacking is a nice touch. On the flip side, there is no improvement on its DEF and it loses its Bunshin, making it quite an issue against units with a lot of power in them. You'd have to rely on Asia's Evasion to avoid getting hit, or go for the Iron Wall or Flicker seishins (from his Pilot Part). Units that can boost Asia's accuracy, DEF, and/or HP will be of great help. For the most part, Omega Master is best used against tankers and units like the Neo Granzon. It's also useful on stages where Status Ailments are common as well as units that use Bunshin. I probably should've known better that Gavan won't be as competitive as he is hyped to be. Stats-wise, he is comparable to the Defender Taiki XAN and much of the Rockman characters. Like Nono, Gavan has a Barrier to make up for the low stats, the difference being while Nono's Barrier reduces damage by up to 85%, Gavan's nullifies damage up to 10k. As long as the enemy's attacks don't deal more than 10k, or is an anti-barrier, Gavan is safe. Gavan also has a slight increase in Accuracy and Evasion (something Nono and XAN lack), but it really isn't much. You'd struggle fighting units that have even just 100% Evasion boost unless you have units like the Omega Quebeley to boost Gavan's accuracy, for example. The Gavan Dynamic is Gavan's best feature, as you are virtually guaranteed high damage with a huge boost in CRT hits. And with the low cost, you'd virtually use it every turn. Won't work against units with Bunshin, though. And because it's not a combo attack, units with Toughness can survive it. You can bypass this by making sure the enemy's HP isn't to the point Toughness can be triggered. I honestly forgot what Spark does. Like the Omega Master Gundam, you'd best use Gavan against Tankers and units that don't have alot of power and agility. I fail to find Gavan of any use in the higher stages of Conquest Mode, however. A pretty good Gundam, really. With V-Parts and Intuition, you could get the X2's accuracy to close to 300%. If its HP goes to less than half, you can potentially raise its Evasion by over 300%. It also does pretty good damage with its Hissatsu. It's best feature is the ABC Mant, which nullifies all Beam Attacks as long as the X2's HP is above 50%. It's a perfect counter against the Destroy Gundam, which is still one of the strongest Gundams out there. In fact, it's perfect when dealing with an All Gundam team or others as long as their primary attacks are Beam based. It's DEF is quite low, though and it can't self heal. So a support unit that'll provide healing or a boost in DEF will help lots. It's 2nd ability is useful in the Conquest Mode Stage where you have to fight an army of Knightmare Frames, as casting Slow them will stop them from moving. Former member of the Alpha Omega investigation team, sent to the SOLIS squad to investigate ruins of mars, ended up founding nothing about the missing main team, after that her squad missions began to demoralize inside SOLIS, and she had to pass trough new training to turn into a test pilot for the new machines that are developed, ´piloting the new Plasma tech developed machines. Overall Olive function as a incredible tank and on normal mode, tough not much on Arena the unit has some flaws on its design but her kit work flawlessly. Olive has a upgradable PP that you can totally unlock already, that makes her incredible also on Conquest VS. The new Heiherm packs has two Hisatsus. both Hisatsus has 600% modifier however Plasma Tacke use only 1 core, yes you're not crazy is 1 core for a Taiki unit Hisatsu, Olive can spam this, like no tomorrow, she is free to use it whenever she likes it basically and it don't hit a single unit but all the units on the range, its a single hit. Now on to what metters. Large Increase in Attack power and gives her dmg mitigation from all types of dmg. Increase attack by 50%, block 100%, hit rate by 120%, and speed by 1000 HP is increased by 15000.
at the start of the wave the unit that has less hp is healed. Basically Olive is a great defender, that works as a defender/support/commander, she buffs your units, reduce their seishins CDs, and gives them more space to breath on hard battles, on normal mode she receive reduced dmg and her armor reasonable to consider her unit mid tier durable for this times, a very strong attack will delete her, however if she is played all right she can reduce cds a lot, heal, tank and and best of all Olive can hit things. Current time: 04-24-2019, 02:19 PM Powered By MyBB, © 2002-2019 MyBB Group.